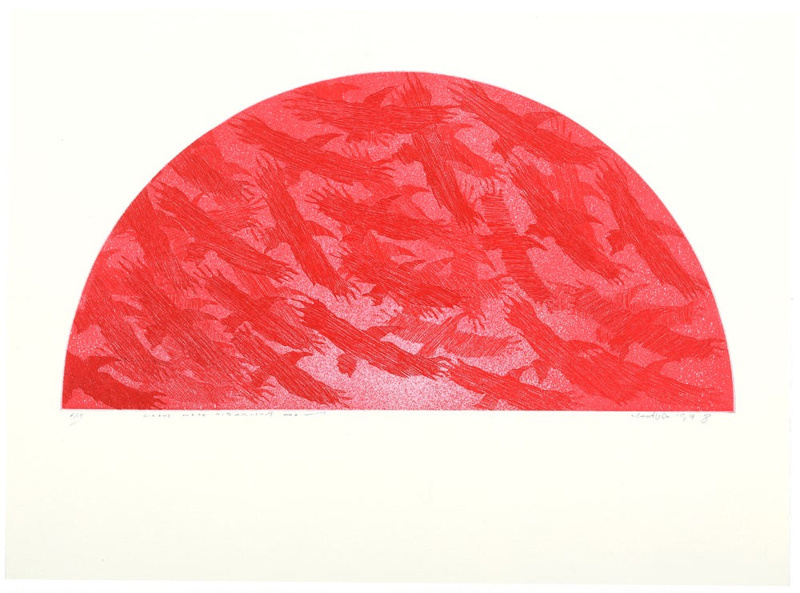 A red ink half-circle print featuring a flock of crows flying north-east. The shape and colour of the print refers to the 'rising sun' motif, which features on the national flag of Japan: from a series inspired by a trip that the artist took to Japan in the late 1990s where he learned about the 'karas' or crows that survived the Hiroshima bombings in 1945. 'Hibakusha' is a term that refers to the survivors of the Hiroshima and Nagasaki attacks. Cleavin travelled to Japan in the 1990s on an artist exchange. He became interested in the crows (karas) that survived the Hiroshima atomic bombing in 1945: 'Hibakusha' is a term that refers to the survivors of the Hiroshima and Nagasaki bombings. The shape and colour of the print refers to the 'rising sun' motif, which features on the national flag of Japan.